When Miuccia Prada took over her grandfather's leather-goods shop in 1978, she came armed with a radical idea: industrial nylon—the same material employed by the military for tents and parachutes. It was a disruption that was at one point unthinkable, but forever changed the runway and set Prada apart for its innovative approach. As the material of choice for Miuccia's debut bag at the fashion house, a black nylon backpack, nylon quickly became a Prada signature, which it has remained for decades. Now, in celebration of the brand's mainstay material, Prada has tapped a trio of female architects—Elizabeth Diller, Cini Boeri, and Kazuyo Sejima—to reimagine the fabric through a contemporary lens as part of their latest project, dubbed Prada Invites. A model walks the runway wearing Elizabeth Diller's take on a garment bag coat. Photo by Alessio Cocchi. Image courtesy of Prada. The fruits of their labor were sent down the runway at the brand's fashion show last week at the Fondazione Prada in Milan, mixed in with looks from their Spring/Summer 2019 collection. 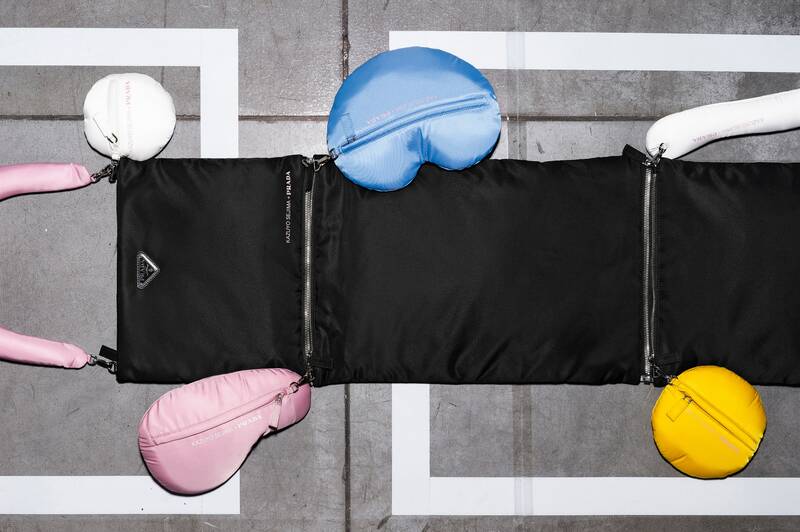 Moving away from the notion that handbags are nothing more than eye candy, the architects reimagined Prada's signature nylon bag into something that reflects the multifaceted, complex, full lives modern women lead today—when you're on the go, shouldn't one bag be able to hold your gym shoes, lunch, and lipstick? "Created by women, for women, this new chapter expounds and expands Prada’s ongoing fascination with multifaceted representations of contemporary femininity, as perceived by a multitude of female viewpoints," writes the brand in a press release. The Yoke bag, designed by Elizabeth Diller. For her contribution to Prada's collection, Elizabeth Diller, a founding partner of architectural firm Diller, Scofidio + Renfro, designed two items, The Envelope and The Yoke, that can be both worn and used. "The distinction between garments and accessories has always seemed odd to me," remarked Diller in a statement. "Why are they considered, displayed, and sold as two separate categories in two parts of the store? I love when the two have a bit more room to flirt and cross-pollinate. Can luggage be worn? I'd like to change that paradigm." Take The Envelope, for example: It's a wearable riff on the garment bag, which functions to protect clothing during travel—both on the hanger and on the body. SANAA's Kazuyo Sejima, the first woman to be named curator of the Venice Biennale, took to revolutionizing travel with her designs. Her pieces, The Daln and The Yooo, are playful takes on travel accessories that can serve as both neck pillows and carry-ons, as well as a travel pouch to be hung on the wall. With their pops of color and dreamy, marshmallow-like shapes, Sejima's designs make travel an efficient and fun affair. Designer Kazuyo Sejima's piece doubles as a travel bag and a neck pillow. In her work as an industrial designer, Cini Boeri examines the relationship between human and house, and studies how our lives can be simplified through design. It is fitting, then, that her design reimagines a messenger-style bag with different modules that create an intentional place for everything inside, like rooms in a house. Specifically created with the woman who juggles the gym, work, family, and whatever else in mind, the modules can be interchanged to accommodate a wide range of lifestyles. "The notion of ’Prada Invites’ encompasses an examination of the intersectionality of design, exploring unexpected conversations between different disciplines," writes the brand in a press statement. Last week's presentation marked just the second iteration of the project, which debuted last spring with designers Rem Koolhaas, Ronan and Erwan Bouroullec, Konstantin Krcic, and Herzog & de Meuron. Prada has yet to announce next season's crop of Invites, but in the meantime, one thing's for sure: We've never seen a neck pillow look so chic before.